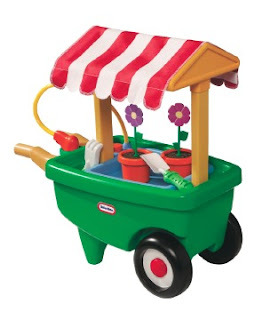 Mommy Blog Expert -- loyal readers know -- loves holding Little Tikes giveaways for products such as the darling Little Tikes 2-in-1 Flower Cart and Wheel Barrow that we gave away as well as reviewed earlier this spring on this blog. 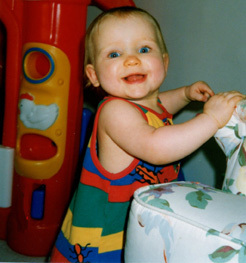 Though my own 4 kids are now 14 and 15 (triplets, plus one more born within a year), they once enjoyed the Little Tikes Coupe, the company's very first product which is still very popular today. We have also owned as well as purchased many other toys for gifts for other little ones from their line because this is a brand that evokes sturdy quality and fun that is also reasonably priced. 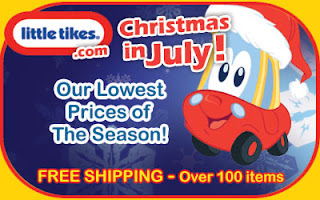 So, when Little Tikes told me today about their upcoming special Christmas in July sales event, I had to write a post about it to share with my readers. From June 30 through July 31 they have put about 150 items on sale. Starting Thursday, there are some spectacular buys on kids items that you will appreciate knowing about if you have a little one to buy for. Check it out yourself by visiting www.LittleTikes.com and typing in the phrase "Christmas in July" and you'll see the great deals to be had. It gets even better. Just for the holiday weekend, Little Tikes is giving all their loyal customers (including this blog's readership) an extra 5% off including sale items. Just use the code: BANG at checkout to redeem the 5% savings (this excludes shipping and taxes), however many products come with Everyday Free Shipping.